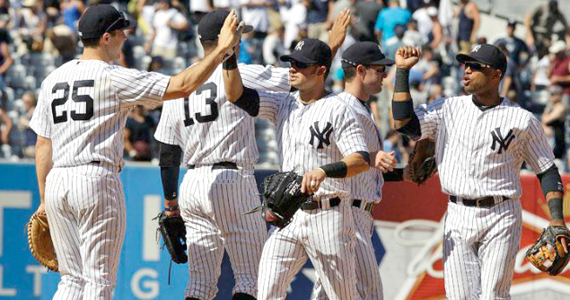 The Yankees opened up a three game set with the Cleveland Indians on Monday. Coming off a big series win over the Mets (again), the Yankees were looking to build on that momentum against the Indians, who are currently battling the Chicago White Sox for first place in the AL Central. Old Jobu has always had a soft spot for the Indians (I played on a little league team named the Indians, and there’s the whole Jobu identity/Major League connection as well), but I was hoping the Yankees could take advantage of this somewhat overachieving bunch and slap them around for a few games. In the end, the Yankees got their Andrew Jackson on and swept the Indians away (I Keeeeeeeeeeed! Also, I still find it a bit ridiculous that they’re still named the Indians in 2012 and no one has sued). 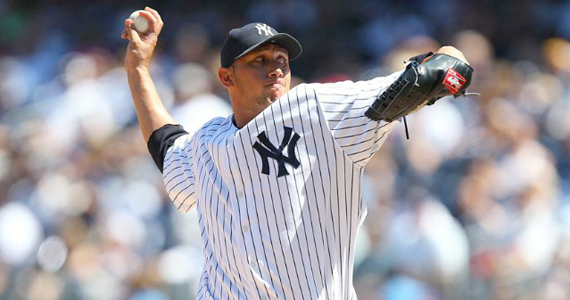 The Yankees sent Hiroki Kuroda to the mound for game one. Kuroda has been slightly inconsistent this season (although he’s been on a solid run of late), and his 6-7 record coming into the game reflected that. The Indians countered with Josh Tomlin, a soft throwing, contact, fly ball pitcher. Predictably, the Yankees jumped all over him early and this beat down was over before it really began. Love those opening salvos! Kuroda really had his splitter working early and often in this game, and the results showed it, as he did not allow a run until he was already out of the game in the top of the eighth inning. In fact, before that eighth inning, he had only allowed three hits! He used that nasty splitter like a champ to rack up seven strikeouts in his seven-plus innings of work. I like when he pitches this well, because there’s very little for me to write about. His final line looked like this: 7+ Ip, 5 H, 1 R, 2 BBs, 7 Ks, 103 pitches and his seventh win of the season. Clay Rapada pitched a very entertaining rest of the eighth inning, thanks to three great defensive plays by Nick Swisher (a sliding catch and two running catches) and Freddy García rose from his grave to pitch an easy ninth to seal the deal. As I said before, Josh Tomlin’s pitching style against the Yankees, and in Yankees Stadium, was a recipe for disaster. The Yankees got to work in the first inning, when Granderson walked and Mark Teixeira singled with one out. This brought up Canó, who came into this game hitting below .150 with RISP. Bad pitching cures all, and Tomlin had some good medicine for Robbie, who smacked a double into the gap to clear the bases (including himself, as he got thrown out going to third). The hit was huge because it not only gave the Yankees the lead, it might just help Canó start driving in runs in key situations again. Girardi picked Monday to give Curtis Granderson a DH day. 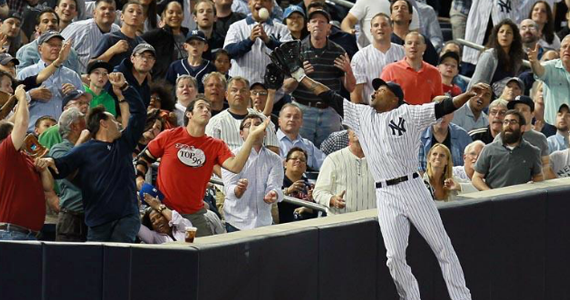 Curtis had played every inning of the season so far, so Girardi DHed him and threw Dewayne Wise into center field. It paid off in the second inning. Wise got a hanging curve ball and absolutely crushed it over the left field fence for a two-run home run. It was his first home run as a Yankee, and it wasn’t a cheapy. I’m pretty sure that ball would have been out of any ballpark. In the top of the third, the Yankees kept the beat going. After two quick outs, Canó got another good pitch to hit on the inside part of the plate and hit it out to right for a solo home run. Not to be outdone, Swisher followed that with an opposite field home run of his own, and the Yankees had a 6-0 lead. Tomlin finished the inning, but left after that with 80 pitches under his belt. That’s what this offense can do when everything is going well. Impressive. The seventh, and final, run came courtesy of Mr. Wise again, when he tripled in Eric Chavez in the bottom of the sixth inning. It was a great game from Dewayne. It’s nice to have guys that can get spot starts here and there and contribute something to the offense. Wise will probably be the sacrificial lamb if Brett Gardner comes back, so he might be auditioning to be picked up by someone else when the time comes. Another day, another Yankees win. Unfortunately, I missed this game, as I was at the movies watching Prometheus, which was tremendous. Definitely check it out. I did follow the game online (always dedicated to my readers) and watch some highlights and the post-game when i got home, so I was able to piece together that Hughes is back, the offense is really rolling, one member of the bullpen is really struggling, and Soriano is the man. The Yankees took this game 6-4, although it wasn’t as close as it the score would indicate. Before Phil Hughes’ last start, I predicted the stinker that he put up against the Braves, because he was simply too good over the month of starts before that and would screw it up to keep me honest. With that start out of the way, and facing the terrible Indians offense, I was not at all shocked that Hughes bounced back strongly in game two of this series. Hughes got himself into and out of a couple of jams in this game, but was overall unchallenged over his eight innings of work. His biggest hooding act came in the top of the seventh when, with a man on third, he got John Hannahan to pop out to left. The reason this was a Houdini trick was that Dewayne Wise used the disappearing ball trick while diving into the crowd to get the out. Wise went into the seats after the ball, which was a great effort, but he did not catch it. In fact, the ball was never even in his glove and a fan was shown picking it up a few feet away from the play and celebrating the find by pumping his fist in the air with the ball in it. The umpire rushed over as Wise was struggling to get out of the seats, did not check Wise’s empty glove and signaled out. Wise and the Yankees quickly got off the field, all the fans told each other to shut up about it and the inning was over. After the game, the umpire admitted his mistake and Wise laughed about it with the media (“What am I gonna do, go back to left field?”). Anyway, Hughes was the man. His final line looked like this: 8 Ip, 6 H, 0 R, 1 BB, 4 Ks, 111 pitches and his 8th win of the season. Not bad at all. Cory Wade came in and had a four run meltdown in the top of the ninth, which meant Rafael Soriano had to come in to clean up the mess for his 16th save. For the first time in a long time, I am not frustrated by the Yankees hitting with runners in scoring position. In the second inning, they even did it all with two outs! What in the world? Justin Masterson was on the hill for the Indians, and he came into the game red hot in the month of June. Unfortunately, the Yankees got to him too. With one out, Teixeira opened up the inning with a walk, but was removed from the bases on a fielder’s choice by Swisher. After Ibañez flied out for the second out, Wise singled Swisher to third. Chris Stewart then came up and hit a soft liner towards third base. Hannahan dove for it, but accidentally knocked it off his wrist and into foul territory, which let Swisher score. Jeter then singled off of Masterson (literally, hit him with the ball), which loaded the bases for Granderson, who hit an opposite field single that scored Wise and Stewey, and the Yankees had a 3-0 lead. The other two Yankees runs were pretty pedestrian. In the bottom of the fifth, Canó singled Granderson to third and he scored on a sacrifice fly by Tex. A-Rod then hit a pretty monstrous home run into the second deck in left field to make it a 5-0 game in the bottom of the seventh, and Stewey added a sacrifice fly in the bottom of the eighth for the final run. Those tack on runs might not seem like a big deal, but they ended up being pretty important after Wade’s meltdown. Overall the Yankees went 4-8 with runners in scoring position (.500) too. That’s how you win ballgames. Notable Offense: HR – Rodríguez (13), RBI – Stewart 2 (9), Granderson 2 (43), Teixeira (43), Rodríguez (34), 2 hits for Jeter, Swisher and Stewart. There was a bit of a dark cloud over this game from the beginning. Before the start of the game, the Yankees announced that they were placing CC Sabathia on the DL with some kind of hip/groin strain, and he would be missing his next two starts. About halfway through the game, the cloud got darker when Andy Pettitte left with an injury and the bullpen (along with some bad decisions by Girardi) allowed the Indians to take a 3-2 lead. Later in the game, the cloud got even darker, when it was announced that the come-backer that had hit Pettitte in the ankle had, in fact, fractured that ankle, and he now needs to miss at least six weeks. Ultimately from all this darkness came a little light, as a clutch late home run and some gritty bullpen work got the Yankees a win and the sweep. Other than blowing the initial 2-1 lead, the bullpen did pretty well in this game. Clay Rapada allowed the game tying hit, but he shouldn’t have been pitching to Asdrubal Cabrera in that situation. Cabrera switch hits, and Jason Kipnis, a lefty, was batting next. Although Kipnis ended up blooping one over Jayson Nix at short, Rapada is supposed to be a lefty specialist, isn’t he? Why is he facing Cabrera with a man in scoring position and the lead on the line? Come on Joe. The star of the bullpen in this game was García. He came in to end the fifth inning, and ended up pitching 2.1 perfect innings with two strikeouts. Considering the fact that he’s probably jumping back into the rotation for Pettitte now, that was a very good sign. Robinson Canó was the star of this game for the Yankees. He had three hits against the Indians and hit a huge opposite field bomb off of Ubaldo Jímenez in the bottom of the sixth that gave the Yankees a lead they wouldn’t relinquish. the other offensive star of this game was Eric Chavez. Chavez got the start at first in place of Teixeira in this game, and he really came up big. 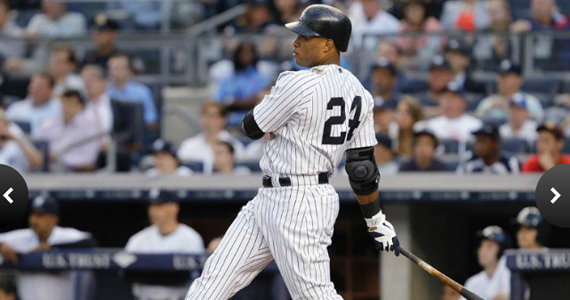 He gave the Yankees their first lead of the game with a two-out, two-run double in the bottom of the fourth inning. He also tacked on the eventual winning run in the bottom of the eighth with an RBI single. Those two were responsible for all of the Yankees’ runs, so there’s really not much else left to talk about. The news on the rotation was pretty serious. They will hopefully only lose Sabathia for two starts, which is better than having him play through the injury and really hurt himself, but the Pettitte loss hurts. 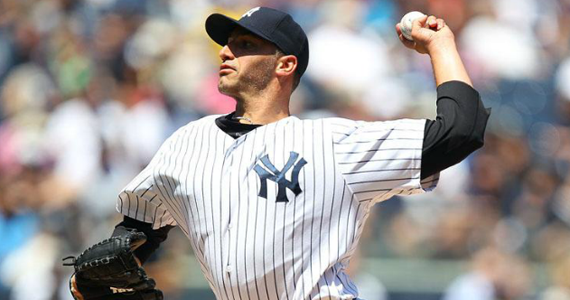 Pettitte has been a revelation for this team so far throughout his comeback attempt. It’s no coincidence that the entire rotation turned things around right about the time Andy came back to the big league club. He’s not just a great pitcher, he’s also a great teacher and a calming influence on the entire pitching staff. Hopefully he can have as much of an impact in the clubhouse while he’s on crutches and in a boot as he did when he was pitching every five days. I think the Yankees will be OK. All they really have to do here is survive for a couple of weeks until Sabathia comes back, and then tread water with García or one of the kids (Phelps, Warren, Mitchell) until Pettitte can come back. There’s no doubt that someone will have to step up and help lead this rotation, but I think things will be alright. García’s lack of pitching this season has actually rejuvenated his arm strength and he’s back throwing at 90 mph, which is a little better than where he was last year. If he can approach the statistics he put up last season, this team will be just fine with him in the rotation. I mean, they are already surviving the year without the irreplaceable Mariano Rivera, so what’s a couple of months without Pettitte?